A few months ago, there was a trending hashtag #wifenotcook amongst Nigerians on social media. The hashtag was said to have been created by a Nigerian man on Twitter who wanted everyone to know that his wife was more than a cook and as usual, this got a lot of Nigerians arguing…Then another hashtag #husbandnotatm was created. If only we knew what our priorities were, these hashtags wouldn’t have been an issue. Me when never eat belle full na me wan come follow people wen eat belle full argue. For why na? Before the dawn of Christianity, the African woman has always worked. Not only have we always worked both inside and outside of the home, we have also cooked in addition; even before the arrival of feminism. Our roles have never changed. Looking at this from a medical point of view as regards our health. It made the African woman live longer. We moved around a lot more than our male counter parts, we went to the farm, we cooked, we took care of our children and lookingat the benefits of exercising, it was more beneficial to us. I grew up watching my mother build her career as a Chef and she was also a mother, a wife to my father and a “cook” to us. The African woman is one of the strongest specie on the planet. We are known to juggle child birth, mothering, wifing(for lack of a better word) and a successful career. 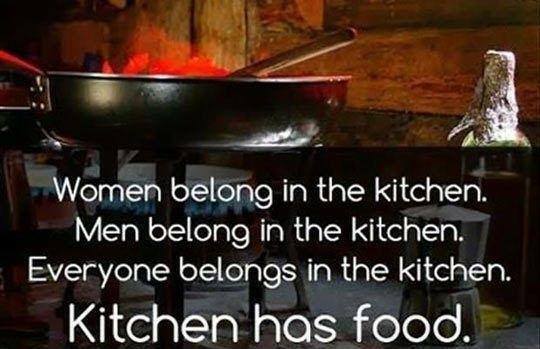 There is a saying that “no matter how much education a woman has, it all ends in the kitchen.” Derogatory? “yes!” And this is possibly the reason why some people dey vex. But funny enough, it is so for some men too. There are men that cook too and they do it daily. For instance, in Germany there are house husbands who take care of their children and cook while their wives work. May be the men doing more these days is the reason their life expectancy has increased. They don’t sit around waiting on us to cook anymore; neither do they wait for us to clean and run after the children. At some point I thought I didn’t need it until I had to learn to make food for my father(God rest his soul). You can’t come on social media and create a hashtag #wifenotcook for other married women to follow and help you trend. Who will cook for your children? And to the single ladies helping the hashtag trend, please wait until you get to that bridge for you know nothing yet…. Listen, what works for family A may not and probably will not work for family B…know what works for you. I’m tired of all these needless arguments…especially by my people. With this recession going on, the only happy moment is probably time spent with your family at the table. “All of una wey dey shout #WifeNotCook upandan. Are you well? Are you not putting the cart before the horse? How many of una go still be wife this time next year? But e sure pass for una say all of una go still be cooks next year. After all, na who go make the Indomie and concoction rice wey you go chop as you dey cry say ‘Ozband waka comot, or e play go meet the side chick/hen? As a result of this #wifenotcook argument, a Facebook friend who happens to be a guy decided to cook eggs. Since we insisted that guys don’t cook, he cooked eggs to #pepperdem…and #pepperdem he did…He dun join bad gang. His very simple recipe for eggs is below…A man’s recipe if you may. 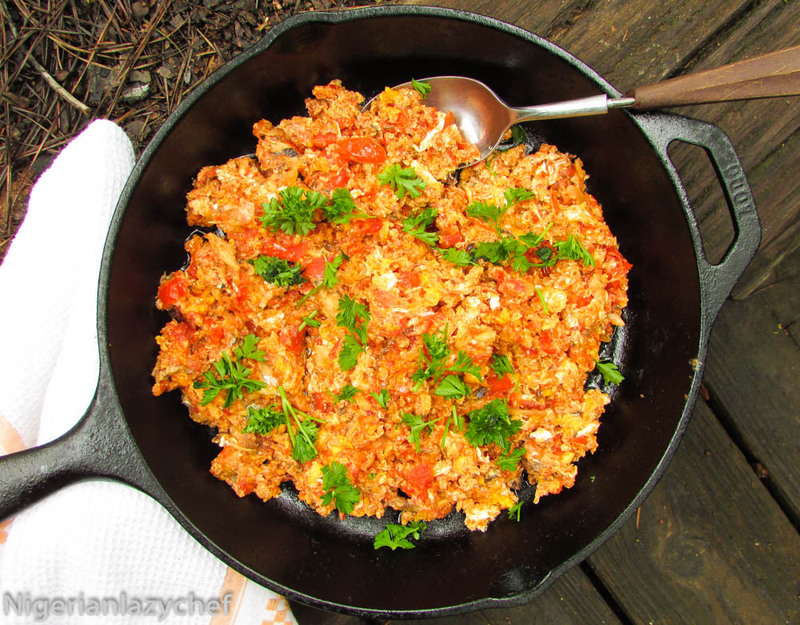 The first time I used his recipe, I added smoked paprika to mine and he insisted that I was cooking something else…I had to “untweak” the recipe and it was still amaze 🙂 I made mine a little dry because I really don’t like stewey eggs. I just made sure I cooked the tomato sauce until it was dry before stirring in the eggs. I hope you enjoy it. Heat oil, add a pinch of salt to the oil and shake the pan. Add the onion and sauté until translucent. Stir in the tomatoes and cook until reduced and rendered. This entry was posted in Bread, Breakfast, Breakfast ideas, Eggs, Uncategorized and tagged breakfast eggs, eggs, Nigerian egg stew, omelete, scrambled eggs, spicy eggs, Tomato egg stew. Lol! ? what an argument! This can only be a Nigerian or African issue…. It’s well! Not a wife yet but the main cook!! Don’t need anyone coming to the kitchen to scatter everywhere ? Haha! I know right. Don’t bring yourself in my kitchen to yeye the place. Thank you Ene. Hahah..These hashtags are an african thing. Thank you an entertaining read.